Supporting a Lifestyle of Luxury and Comfort! 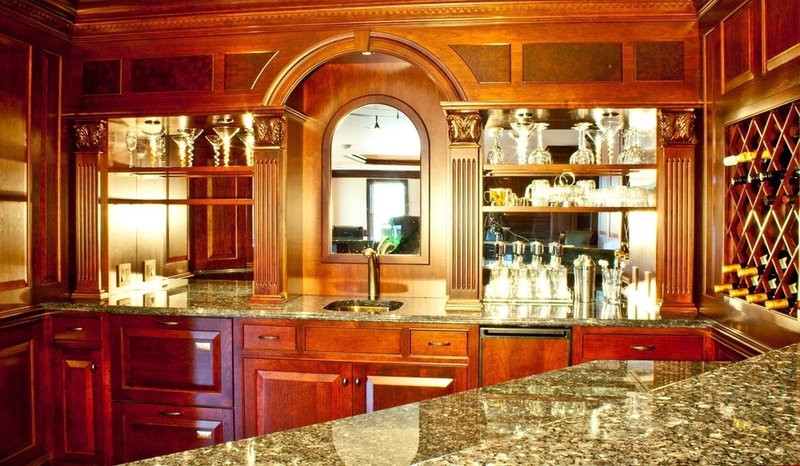 Established in 2003, Murray Millwork is a leading Custom Millwork shop. Architects, Builders, Designers, and Home Owners trust our company to bring their concepts to reality, on time, and within budget. Looking for inspiration? Look no further than the Murray Millwork Photo Gallery! Do you need help planning your next project? Our team at Murray Millwork is happy to help! "We concentrate on Craftsmanship, Tolerance, and Precision to produce top Quality Products exceeding Architects and Contractors expectations." Murray Millwork is ready and able to provide custom Architectural Millwork with a level of quality and lead-time that is unsurpassed within the industry. Custom Luxury by Murray Millwork quickly and accurately provides virtually any Architectural Millwork design necessary, regardless of complexity or size. Custom Luxury by Murray Millwork provides the finest custom Cabinetry available at an affordable price. Whether it's new home construction or remodeling, our innovative design team can assist you with ideas and solutions to suit your Lifestyle of Luxury andComfort. We offer furniture-grade Cabinetry for every room in your home, from the kitchen and baths to the study, office, wet bar, laundry room and even closets. Our Custom Luxury Hand Scraped Collection floors are handcrafted plank by plank to create a unique look that is timeless and truly a work of art. Our hand sculpting techniques showcase the wood’s natural grain and character as well as demonstrates our commitment to producing a completely custom milled, one-of-a kind Hardwood Floor. A Murray Millwork Custom Luxury Hand Scraped floor has the richness and classic beauty of old-world style but inspires and challenges you to limitless decorating possibilities. Murray Millwork provides Interior Doors for Commercial and Residential projects to match a variety of decors. These doors come in a multitude of styles from Traditional, Craftsman, Shaker, French and Contemporary. Custom Luxury by Murray Millwork allows for unlimited possibilities when it comes to features such as panel, glass, size, and species of Interior Doors. Custom Luxury by Murray Millwork offers Entry and Exterior Doors to match a variety ofArchitectural styles. Exterior Doors are available with a myriad of glass panel sizes, shapes, textures, and decorative patterns to bring in as much light as you desire. excels in its capacity to meet any and all design needs – utilizing an unlimited variety of Door Hardware that is durable, functional, and esthetically pleasing. Murray Millwork carries a wide array of new constructionWindows in solid wood, vinyl, clad and aluminum all with beautiful design and the superior Craftsmanship you demand. With a wide variety of shapes and sizes, we'll help you create virtually any look imaginable. Architects and designers value the design flexibility of our complete lines, Builders appreciate the ease of Installation, and homeowners love the great looks, energy savings and care free maintenance. Questions or Comments? Please fill out your information and a team member will be in contact with you shortly. Thanks!